India is the nation which has unity in diversity, but a state does not think that way. 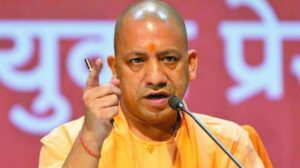 The West Bengal government on Sunday denied permission for Uttar Pradesh chief minister Yogi’s helicopter to land in the state ahead of an election rally. Yogi’s helicopter was to land at Balurghat in North Dinajpur near Malda, where he was to address a rally at 10:30 am, but it was not allowed. The permission request was pending for the last three days. Angry BJP workers surrounded the district magistrate’s house in protest. Earlier, the West Bengal government had denied permission for the BJP president Amit Shah’s chopper to land in Malda district. He eventually held a rally there last Tuesday. The UP CM’s office said the permission for CM Yogi’s rally was also declined by the West Bengal government without any prior notice. According to the officials, West Bengal chief minister Mamata Banerjee is afraid of CM Yogi’s popularity. In its defense, the Malda district administration stated that it was not possible to grant permission to land VVIP helicopters that week owing to construction work. Before the elections, West Bengal is crucial in the BJP’s plan for the 2019 Lok Sabha polls and the party has set itself a target of 22 seats in the state. The party which currently holds two seats in the state has been bolstered with a number of senior Trinamool Congress leaders joining it. By banning Amit Shah and Yogi Adityanath’s visits and rallies, West Bengal Chief Minister Mamta Banerjee imposing her “monarchy” in the state. She has her own style of ruling the state and the way apart from the central government. On Sunday, she was on the hunger strike against the CBI’s probe on the police commissioner of Kolkata’s connection with a chit fund scam.